DIFFERENT SHAPES TO WHAT WE SEE. WILL YOU HARVEST THEM WITH ME?" A dad and two kids are off on a October expedition--not to the playground or to get haircuts, but to the farm to fetch home some pumpkins. They climb out of their car and into a hay wagon pulled by a big green tractor and bounce off down the lane, following the signs and looking for shapes. Even the sign that says PUMPKINS is a rectangle, and there are rectangles all around, bits of bark flaking from the tree trunk, hay bales, the lattice on the wagon's sides, even the sides of houses. Circle shapes are everywhere, too--apples, the top and bottom of apple baskets, wagon wheels, and even black spots on a white cow. But there are more esoteric shapes, as well. Hen's eggs are oval, and so are winter squash on the vine. Kites are diamonds in the sky, and with a pumpkin on board, Dad can carve a triangle for a nose, and some stars for its eyes. AND CHICKEN WIRE WHERE FOXES ROAM. 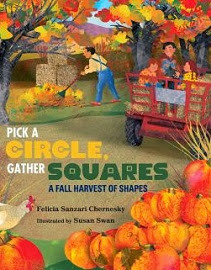 And at last those round pumpkins for round pumpkin pies are on their way home with the kids in Felicia Sanzari Chernesky's Pick a Circle, Gather Squares: A Fall Harvest of Shapes (Albert Whitman, 2013), with verses with verve and a bright autumnal palette from Susan Swan's jolly farm collages to provide the lessons in shapes and appreciation for autumn produce as well. A good pick for prep for the fall farm trip or a field trip to the pumpkin patch for primary classes and an introduction to the traditional foods of Thanksgiving as well.